There have been different email encryption products available since the 1990s. However, the reliable solutions have been too complex to take in use and too difficult to use for end-users. During recent years different cloud-based encryption providers have introduced user-friendly and convenient solutions. Unfortunately, these cloud-based solutions do not offer high-enough security level and control for the demanding customers. As a result, many organizations have prohibited the use of email and have decided to rely on alternative systems when communicating confidential information. Secure alternative systems are often less efficient and user-friendly than email, so confidential information tends to end up in the email in spite of prohibitions. EEZY KEYZ® has been developed as a military-grade encryption solution while simultaneously being as user-friendly as normal email. It is easy-to-adopt, operate and use on customer’s existing hardware. The customer-tailored and dedicated encryption system brings a lot of benefits. Firstly, there is no need to depend or trust cloud providers or service providers. The customer stays in complete control of its data, including email messages, attachments and encryption keys. This helps avoiding political risks relating to encryption products; in many countries’ vendors can be forced to turn over encryption keys to the authorities. With EEZY KEYZ® this is not possible because only the customer has access to the keys. It is possible to tailor the system features to perfectly match customer’s needs; including the backend system features, encryption application features, used algorithms, etc. The result is an encryption system which allows easy, quick and secure way to deliver confidential information in any format (image, video, documents, etc.) whenever and wherever. 0. Users’ encryption keys are automatically stored on the key server when users register to the system. 1. When user inserts the message recipients, the encryption client software automatically retrieves the public keys of the recipients from the key server. 2. User composes the email message normally. The software automatically encrypts all messages and attachments and digitally signs the messages by default. 3. User sends the email normally without any extra steps. The encrypted email messages pass through company email servers like any other messages. 4. Receivers receive the encrypted email in their inbox like any other email. 5. The message is automatically decrypted on user’s device temporarily when viewed. The message and attachments are stored encrypted both on the user’s device and email server. The EEZY KEYZ® system consists of encryption clients and the backend system. 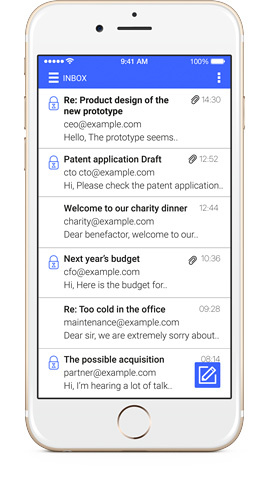 For Android and iOS there are standalone EEZY KEYZ® email clients. For the desktop there will be an EEZY KEYZ® Outlook Plugin and Firefox and Chrome browser extensions later in 2019. All of these clients are compatible with each other in regards of encrypting and decrypting emails. The clients handle the creation of the ECC keys and encryption and decryption of the email messages and attachments automatically, while the backend system handles the storing and delivering of the required ECC keys. The private ECC keys are stored encrypted with AES 256-bit encryption. They are only available to the correct users who know the passphrase which is used to decrypt the private key. The public ECC keys are available to all users. The email messages and related data are encrypted with AES 256, while the ECC is used to encrypt the used AES keys. The used public-key cryptography uses EC keys. The used cryptography schemes are ECDH for shared secret generation between users and ECDSA signature to validate sender authenticity encryption. The default EC curve is curve25519 offering 128 bits of security. Contact our sales for more information!